The Llandow circuit has plenty of everything; a good mix of fast and slow corners, some decent chicanes and plenty of overtaking spots. 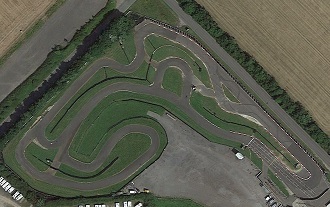 The kart track is run by an enthusiastic and friendly team and the twin-engine karts are well suited to this type of track. Various types of events can be booked at very reasonable prices as well as arrive-and-drive and exclusive track hire for owner drivers. Llandow (Vale of Glamorgan) is three miles west of Cowbridge. Leave the M4 at J33 and turn left on to the A4232. Follow for three miles and turn right on to the A48 at Cowbridge. As you leave Cowbridge there is a turning depicting a sign with a chequered flag and a caravan. Follow this road for three miles past Llandow Village and the circuit is signposted on the right. Two x 15 minute sessions for dads and children to race with the kids.